I’m far from being the biggest Shakespeare scholar on the block, so having me review The Hollow Crown might not seem like the best idea at first blush. However, the beauty of this mini-series is how accessible it is to even those of us whose last brush with the playwright came during high school English. It helps that the cast is composed of up-and-coming faces of this generation of actors, alongside veterans of stage and screen who define the word gravitas and could probably do Shakespeare in their sleep. Much like the long-standing works of the English author himself, The Hollow Crown is equally enjoyable for neophytes making their introduction to Shakespeare or scholars looking for a new interpretation. Hit the jump for my review. The first installment of the four-part series is adapted from Shakespeare’s “King Richard the Second”, centering on the English king who ruled between 1377–1399. Adapted and directed by Rupert Goold, Ben Whishaw (Cloud Atlas) stars in the title role, with notable names Rory Kinnear (Skyfall) playing Bolingbroke and David Morrissey (The Walking Dead) playing the Earl of Northumberland, just to name a few. Whishaw has the perfect sensibility to play the vain and eccentric ruler who sealed his fate after mishandling a feud between two nobles. Two things immediately stand out when watching Richard II. The first is the outstanding production quality. Attention is paid to every detail, whether it’s the flowing robe and jeweled crown of Richard II or the various landscapes and settings the production travels to. The second is the language. That might sound a bit strange considering that, yes, this is in fact Shakespeare, but the production quality is of such a high cinematic caliber that, for someone who isn’t used to hearing Shakespeare spoken aloud, the pairing takes some acclimation. Once you settle in, however, the full experience is incredibly rewarding and worthy of repeat viewing, especially since the quality never wavers throughout the remaining plays. Henry IV: Part 1 & 2 were adapted and directed by Richard Eyre. 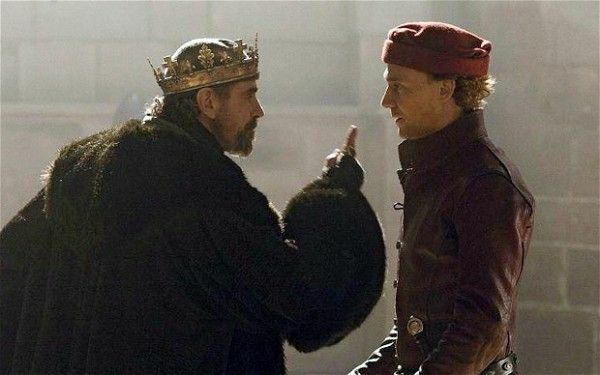 Starring Jeremy Irons (Die Hard: With a Vengeance) as the title character, the first part of the story centers on his son, Prince Hal – played by Tom Hiddleston (The Avengers) – and his coming of age. While the king is dealing with a brewing rebellion, Prince Hal busies himself in taverns with low companions, the principal of which is Sir John Falstaff (Simon Russell Beale). Inevitably, war breaks out, offering Prince Hal an opportunity to prove himself to his father and distance himself from the low-born. Although King Henry IV himself drives the story forward, the real treat here is watching Hiddleston and Beale play off of each other. The heart of the story is based around Prince Hal and Hiddleston’s strong performance does justice to the young man’s tale. Henry IV: Part 2 picks up where Part 1 left off, focusing on Hal’s path to kingship and, quite separately, the rejected Falstaff’s march to the grave. Hal continues to stumble along that path as he must once again earn his father’s trust and respect. It doesn’t help that Hal prematurely takes his father’s crown and throne before the old king is confirmed to be dead. It’s unfortunate that the close of Part 2 means an end to the on-screen relationship between Irons and Hiddleston, but the latter gets a chance to come into his own, both as a character and an actor, in the concluding installment of the series. The Making of Henry IV (~10 minutes) – A behind-the-scenes featurette with commentary from director Richard Eyre, Tom Hiddleston, Jeremy Irons, Simon Russell Beale, and Julie Walters, They discuss the coming of age of Prince Hal (Hiddleston) and his gradual awareness that he must distance himself from the lower-class lifestyle in order to take on his responsibility. The discussion also turns to the battle of Hotspur and Hal, filming the Battle of Shrewsbury, and the Fall of Falstaff. Perhaps the most well-known of this tetralogy, Henry V was adapted by Ben Power and Thea Sharrock; the latter also directed. 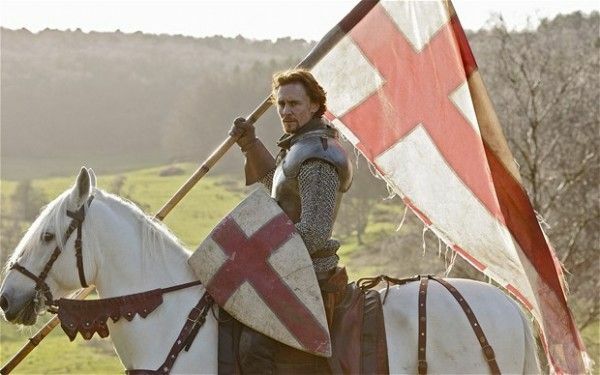 It centers on a more mature Prince Hal (Hiddleston) who has ascended to the throne as King Henry V. The centerpiece of the play is the Battle of Agincourt, although events both before and after the conflict are also featured. 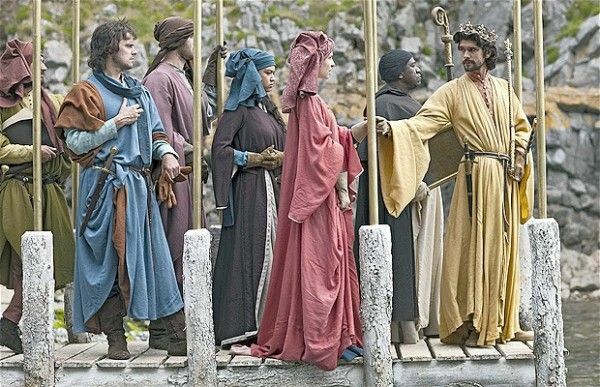 Hiddleston shines as he delivers Shakespeare’s famous speeches at the siege of Harfleur and on St. Crispin’s Day; he also delights in his attempts to woo the French princess, Catherine of Valois (Mélanie Thiérry). While it might already be the most recognizable of the four plays, Henry V is all the more enjoyable thanks to the three installments that preceded it. All in all, The Hollow Crown is a worthwhile addition to your home video library, whether you’ve been into Shakespeare from the earliest of days or if you’re just a fan of today’s talented British thespians. The Making of Henry V (~10 minutes) – A behind-the-scenes featurette with commentary from Tom Hiddleston, director Thea Sharrock, Paterson Joseph, producer Rupert Ryle-Hodges. One interesting note: Sharrock made Hiddleston do the big speeches while running along the Thames in the open air. The Making of a King (~10 minutes) – Behind-the-scenes look at getting the entirety of The Hollow Crown produced. I happen to be in agreement with the commentary on how the series exemplifies Shakespeare for this generation of actors and is a great introduction for a contemporary audience. This featurette takes a look at the entirety of the four stories, how they rediscovered Shakespeare in this new version, and how they made Shakespeare accessible and enjoyable.